Each student uses a beautiful spoon carving knife, available for purchase if desired. 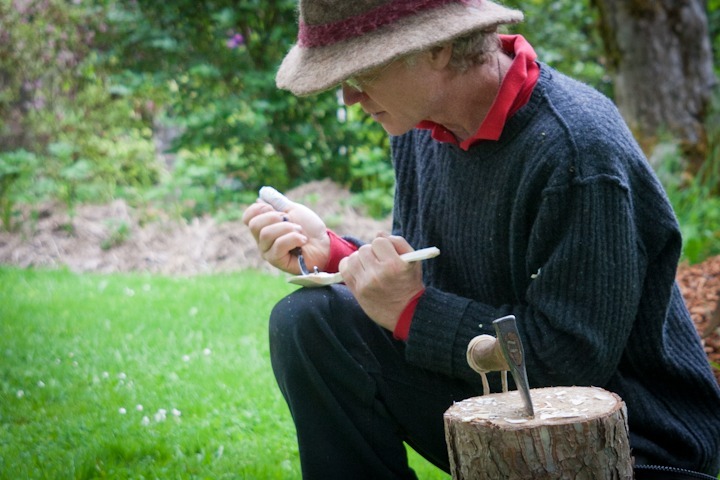 Kiko Denzer guides you through the art of hand-carving a spoon from a branch. Our word “spoon” comes from a root meaning “chip of wood.” Before mass-production made metal spoons cheaply available to all, whole villages would be devoted to the production of spoons. A beautiful wooden implement also makes eating your morning cereal a uniquely pleasant (and much quieter!) experience. You will need to provide your own straight blade knife with a comfortable handle (recommended are a Mora sheath knife, or an Opinel folding knife; blades should be carbon steel, not stainless; both are widely available at standard retail outlets). If you have sharpening kit(s), please bring them. Class size is limited to allow for individual instruction. Bring your own knives or purchase at class: Curved spoon carving knife (pictured above) $55, and straight edged knife $20, will be for sale at class. If students do not want to own a curved knife, loaners will be available for use during class. Read A Beautiful Spoon by Kiko to learn more about his creative and design process. In this insightful article he shares his enjoyment of discovering and creating a wooden spoon. Check out Kiko’s essay on The Value of a Spoon. Kiko helping a student with his spoon. Also, Carving Your Own Wooden Spoon takes you on a photo journey of one group’s experience in carving their wooden spoons with Kiko at Nana Cardoon. Vegetarian lunch and beverages are homemade from farm ingredients as the season allows and are included in the price of your reservation. Spoon carving is popular and class size is limited, so there are three classes this season – June 17th, and August 6th and September 9th. Contact Charlene to reserve your spot.